Aspartame in Milk Without a Label? Not exactly. | Butcher Block with a Side of Farming! Aspartame in Milk Without a Label? Not exactly. Regardless of how you feel about aspartame, milk, or flavored milk, there is no conspiracy here. The dairy industry is not asking FDA to allow them to add sweeteners like aspartame to milk and hide it from you. Let's clear this up. As with most web inspired uproars, I don't know where or how this originated but I read it on Natural News here. They got it wrong. Way wrong and in doing so, aided a flurry of unnecessary panic along the information highway. No, I don't make milk. I'm a butcher. I make meat. I make meat under USDA inspection. In order to do that, I am intimately engrossed in labeling regulations and jargon. How they come about, how they work, and what their purpose is. This whole aspartame hoopla is a misunderstanding of regulatory jargon. Let me explain. In order to do that, we're going to have to touch on food label regulations. I apologize in advance because this will be a bit lengthy. Hang with me please. First, let's take a look at the request by the International Dairy Foods Association (IDFA) and the National Milk Producers Federation (NMPF). You can read the entire request in the Federal Register here. The petition is asking FDA to change the standard of identity of milk (and 17 other milk and cream products) to allow any approved sweetener (both nutritive and non-nutritive) to be allowed in the optional characterizing flavoring ingredients (example: chocolate or strawberry). Key words: Optional. Flavoring. Nutritive. Non-Nutritive. The main difference between nutritive and non-nutritive is that the latter is zero to very low calorie sweeteners used to increase sweetness without adding extra calories. Like putting Splenda in your coffee instead of table sugar. They are not asking to just toss in some aspartame to regular milk and keep it on the down low. Now we need to explore some basic food labeling regs and jargon. Most all foods have a standard of identity. The standard for milk (can be found here) allows "optional ingredients". One of those allowed optional ingredients is "Characterizing flavoring ingredients". Within the characterizing flavoring ingredients only nutritive sweeteners are included in the current standard of identity. These sweeteners used in flavored milk like chocolate or strawberry, for example, show up in the ingredient statement. Here's a random chocolate milk label I found. In this example, HFCS is included on the ingredient statement. Now. Already. It's there. Just look for it. HFCS is a "nutritive" sweetener. This complies with the current standard of identity for milk. What if I told you that milk could already use sucralose, aspartame, or other approved safe non-nutritive sweeter and does it now as long as it follows a few additional requirements. Now, as it currently stands, "non nutritive" sweeteners may be added (and equally declared in the ingredient statement) IF the label makes a nutrient content claim like reduced calorie or __ % fewer calories as an example. Take a look at a screenshot of Nesquik. For full view see here. This is an example of a non-nutritive sweeter used as an ingredient in the flavoring of milk that is making a nutrient claim. In this case "No Sugar Added". This is a screenshot from Nesquik. You can see the full view here on their page. This example is using sucralose (Splenda is sucralose based) and acesulfame potassium (aka Ace K), non-nutritive sweeteners. It is right there on the ingredient statement. 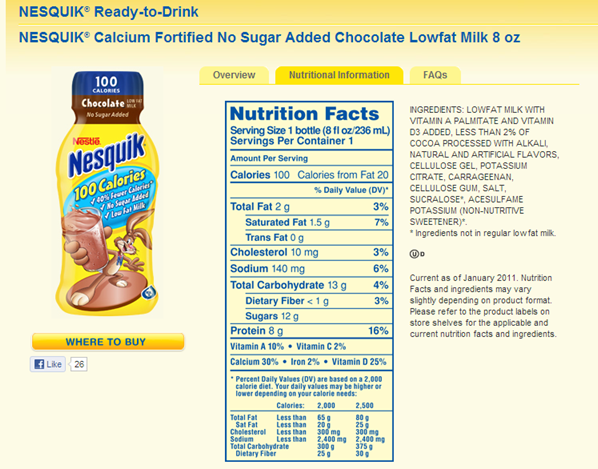 Nesquik makes a claim, "no sugar added" and calorie claims. Because of this claim, this complies with the standard of identity for (chocolate) milk. Had it not made the claim, it could not be called chocolate milk because sucralose is added as the sweetener and not sugar or other nutritive sweetener. 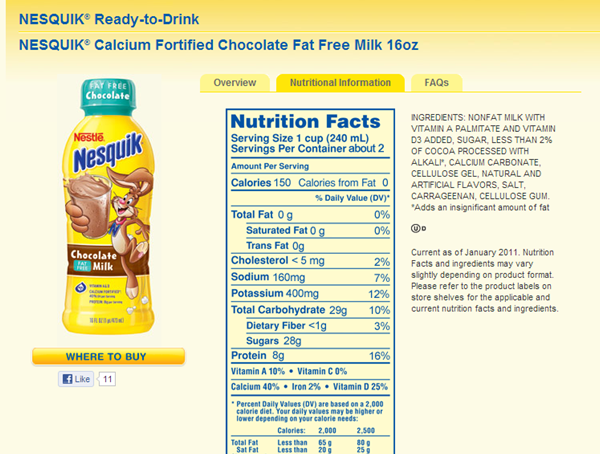 Now take a look at a snapshot of Nesquik's "Chocolate Milk" without any caloric or sugar claims. This is a regular standardized milk with no nutrient claims. Note the ingredients. This is a snapshot from Nesquik. To see full page view here. In this product, sugar is the sweetener. Sugar is a nutritive sweetener which complies with the milk standard of identity. In each example, the sweetener is not hidden. It is still required to be in the ingredient statement. The petition to change the standard of identity will not change that. Aspartame, if added, would be right there on the container listed in the ingredient statement. If you choose to avoid it, you absolutely can. The necessary information is there to help you to purchase the type of milk that suits your needs best. It is not being hidden and is not being proposed by the dairy industry to hide it from you. All they are asking to do is allow non-nutritive sweeteners without making a nutrient content claim on the package (like No Sugar Added or Reduced Calorie). They are simply asking that the standard of identity of milk make more sense. The sweetener, whatever is used, will be right there on the label in the ingredient statement. No gimmicks. No conspiracy. Just a huge misunderstanding. Now who wants some milk? I certainly do! ...but I'll be checking those ingredient statements to make sure I get the milk I'm looking for.